Another night like no other, at The Zigfrid von Underbelly Of Hoxton! Packed with talent from several genre’s of music, to create a bloody marvellous time. Hosted by the exuberance that is ‘Bill Dury’, he promises hats, laughter and energies that will tickle the soul.. There will be Five Acts, plus a magician (Because why not?) each of their own genre and discovered from all around London Town. 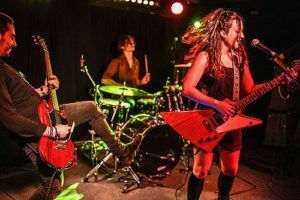 Dutch Mustard – Launch night for riff rocking alt grunge band from London. After a year of blood sweat and tears, the Grunge/Rock four piece are fuelled with energy and ready to show you what they’re about. For lovers of chugging guitars and solid rhythm. Alice Callari -Singer/songwriter from Camden Town. Bill Dury and The Collaborators – Son of Ian Dury; Bill is a troubadour and bleeds soul and music to the people. Evan Pryer – Rhythm and Blues guitarist,singer and songwriter playing a fusion of Blues,soul and funk and is writing an EP. Saults – Funk, rock and pop from a French trio with high energy live sets.